Vigo station now occupies a new site with the station being modern and boasting all the usual facilities. The rolling stock for this service is provided by Portuguese Railways (CP = Comboios de Portugal) and consists of a three-car diesel unit leased from Spanish Railways. Somehow it didn’t meet my expectations for an international train especially as there was considerable graffiti sprayed over the sides and windows! Departure was prompt at 0902 and we rattled along at a fair rate on what is technically a non-stop run to Porto. However a brief stop is made at Valenca, the first station over the border, to change the train crew. Leaving Vigo you get a good view to the left of the river estuary, port facilities and the suspension bridge across the river. Photo - The International Train waiting departure from Vigo for Porto. Reaching the Spanish/Portuguese border you cross what is the first of a number of bridges designed by Gustav Eiffel whose iconic tower in Paris needs no further comment. Once across the bridge most of the views are to the right as in places the railway runs very close to the sea. However one small problem was the sea mist which had rolled in during the night which was obscuring much of the scenic interest. However I revisited this area later in the visit and can confirm that this is a pleasant stretch of coast with hills rising almost from the shoreline. The only major station passed en-route is at Viana do Castelo immediately after which the train crosses another Eiffel bridge this time with a road above the railway. Here the railway turns inland with the green countryside dotted with houses. Every spare piece of land seemed to be used for growing something including vines, maize, marrows and vegetables. It was nice to see that the stations in Portugal are still well kept with some having wonderful blue and white tiling depicting historic scenes. It brings back good memories of the 1970s and 1980s when I travelled this part of Portugal in search of the steam locos that were still at work. The final stretch of route to Porto is not particularly noteworthy and arrival in Campanha station was a few minutes earlier than the advertised time of 1017. Campanha station is modern and rather soul-less but does provide a range of services to the rest of Portugal. 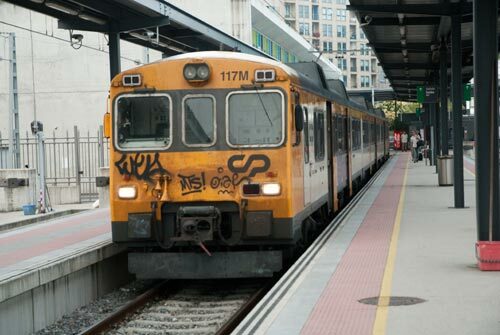 To conclude it is a pity that Portuguese Railways do not provide some better rolling stock as I am sure an enhanced service would improve the number of users. Cleaning off the graffiti from the windows would help improve first impressions which were not that great. Even the provision of a trolley service of drinks and light refreshments would be a step in the right direction. However don't let these negative thoughts put you off using the train.